Miracles are the life of Jesus Christ manifested in people. My father is constantly urged to share the secrets that have brought such success to the Osborn global ministry during nearly six decades. The truths in this book are what we have taught to people of practically every major religion on earth. They have brought miraculous results in every nation. These dynamics were first published in Java, 1954. Today, this is our most translated book. It works like a miracle. 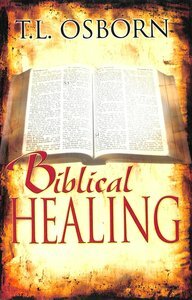 Thousands are healed while reading these truths because they create Biblical Healing. This enlarged edition includes Our Four Vital Visions, a half-century of Our Miracle Witness, plus 324 linked Bible verses that comprise Christ's healing ministry. The ministries of T. L. and Daisy Osborn have made an unprecedented impact on the world in our time. They are valued among the great soulwinners of this century. Married at ages 17 and 18, the Osborns were missionaries in India at 20 and 21. In 1949 they instituted the OSFO International Gospel Center-a world evangelism and missionary church organization. Their life commitment: To express and to propagate the gospel of Jesus Christ to people throughout the world. Their guiding principle: the top priority of the church is the evangelization of the world. The Osborns have conducted mass crusades in over 70 nations, preaching to audiences ranging from 20,000 to 250,000 nightly and more. They have sponsored over 25,000 national preachers as full-time missionaries, reaching their own unreached tribes and villages. They have published gospel literature in 132 languages and dialects. They have produced documentary films and crusade tapes for public evangelism in nearly 80 major languages. They have provided airlifts and huge shipments of soulwinning tools for gospel missions and workers worldwide. They have furnished vehicles with films, projectors, screens, generators, P.A. systems, audio cassettes and cassette players, and great quantities of literature for evangelism abroad.